Who am I kidding. Everyday is a genealogy work day. If I have five minutes on the computer I start looking for names, places, anything that comes to mind. I haven’t had much luck lately. BUT, last night I was going through my pictures of cemeteries and got carried away. I did find an interesting photo. 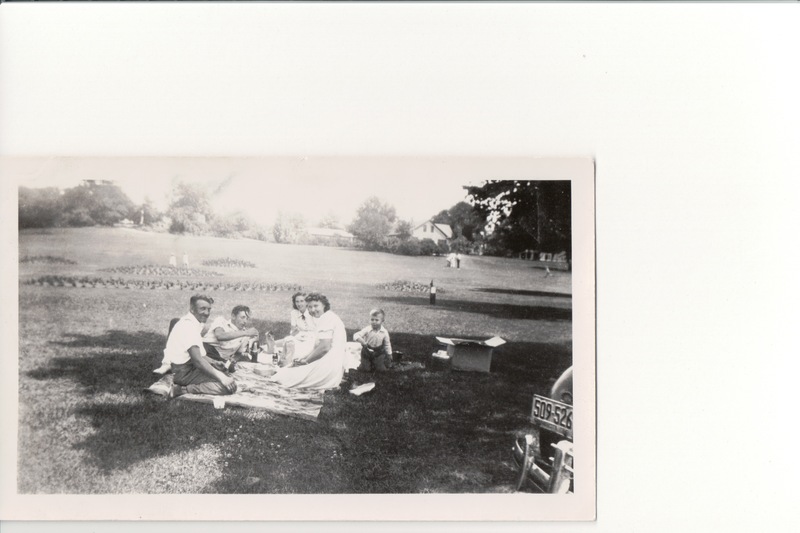 I found a picture of my mother having a picnic with probably a girlfriend and two men. Obviously the man laying down is probably with the girlfriend but the gentleman sitting across from my mother must be with her. I would think so anyway. The little boy is my uncle, my mother’s brother. In all of the pictures I’ve looked at so far I have not seen this man before. I would say the picture was taken in the 1941/1942 time frame. I say this because my uncle was born in 1937 and it looks like he is probably four years old. I was born in late 1942 and I’m not with my mother in the picture. It also looks like the picture was taken during the summer months, probably Jul-Aug time frame. And the place was probably Austin, Minnesota. I’m learning to be a good detective. At least I hope I’m getting some of this down right. So now comes the big question. Who is this man???? Other deductions—my DNA comes up with two names that keep coming up to me. Mattocks and Kinsel. Could this man be the one??? So more searching, detective work, and asking more questions. Will keep you posted. Until then……………………………..